Old John Hebert fished out Lake St. Clair his entire life. He made all of his own nets and invented the hoop net and angled for the demise of all of the fish he met. French Canadian John Hebert was born in Sandwich, Ontario, the son of a fisherman who set his nets and trolled Lake St. Clair, the St. Clair River and the Detroit River. The baptismal register of the parish of Sandwich, diocese of Toronto, records that on February 10, 1832, the priest missionary baptized Jean Baptiste, “born yesterday of the lawful wedding of Jean Baptiste Hebert, and Marguerite McGregor.” Eustache Hebert is listed as his Godfather and Therese Beaubien as his Godmother. John Baptiste the father taught his son John Baptiste how to successfully fish the lake and rivers. John began his fishing career at Mackinac with a gill net, working for a man named LeDuc. After that he fished with the Clarks and then with A.M. Campau who owned Belle Isle. In 1858, Capt. William P. Campbell brought out the Gem, which had run between Detroit and Amherstburg for a year. When Captain Campbell announced his intention of engaging in the ferry business he started a shipping tug of war. Dr. Russell at this time owned the Ottawa, Windsor and Argo No. 2, and in order to keep Captain Campbell off the route he gained control of all the dockage on the river between the Detroit & Milwaukee and Michigan Central depots. Captain Campbell managed to buy the city dock at the foot of Woodward Avenue which was just large enough to accommodate the Gem. Hanging up a sign reading "One cent fare - no monopoly," he began a lively competition with Dr. Russell’s ships to carry passengers and freight, eventually winning most of the business. In 1861-1862, John Hebert formed partnership with William Campbell and his son Walter Campbell of the Detroit, Windsor, and Belle Isle Ferry. He well remembered the brick hotel on the island and big crowds of people coming over on Sundays on the little steamer Gem which also ran between Detroit and Windsor. William Campbell and John Hebert didn’t remain partners for long. John moved on from business with the Campbells to the Campaus. In 1863 he rented Belle Isle from Mr. Campau for $150 a year. “I was the king of Belle Isle,” he joked in an April 7, 1901 Detroit Free Press interview. He explained that he raised cattle and hogs there and established a good business. He also operated a shingle mill in Sandwich East from 1863 until 1865 when he started fishing for himself. According to John in the fall of 1883, there was such an over supply of fish that John and his men plowed ditches on Belle Isle where the fisheries were located and buried 300,000 of them in order to preserve them. In his April 1901 interview, John stroked his beard and remarked that he had been fishing for 53 years and he still caught more than his share of fish. Every year about the first of June, Old John, as the locals called him, went into Lake St. Clair to set night lines for the sturgeon and cat fish which were about the only fish to be caught on night lines. “Of course, I use my nets, which I make myself, all of them in the daytime,” he said. 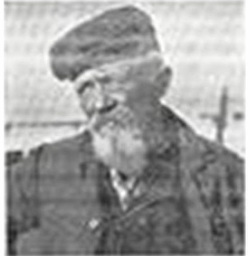 Old John Hebert lived in a colorful houseboat that he moored in the St. Clair River near Walkerville. His boat, which Old John called the St. John, was built like most of the small river scows. Its multi-colored paint job is what set it apart from the others. Part of the hull gleamed bright vermillion, the bulwarks glistened white, and a rusty stovepipe stuck up from the sky blue cabin. Overall the St. John measured thirty feet and the cabin fourteen feet in long. The stern served as an entryway to John’s cabin and visitors wearing hats put the hats and possibly themselves at peril of a dunking if they didn’t remove them. The Detroit Free Press reporter negotiated the entrance safely. Inside a small stove still glowing from dinner fire embers sat in one corner of the narrow cabin. A narrow wooden table held the remains of dinner, a tiny alarm clock four hours behind time, and a lantern. A large calendar hung on one wall and on the opposite wall a faded photograph of a woman with a face brimming with cheer and helpfulness and a string of prayer beads around the frame watched over all. A cot with a blanket and tarpaulin tumbled over it rested on one side of the cabin and across from it sat his trunk. Old John himself sat in a corner weaving the skeins of a fishnet together with great skill and speed. He made all of his own nets and invented the hoop net. He angled for the downfall of most fish. Like his hoop net, Old John Hebert was a Lake St. Clair original.